How Do I Live In Space? Sovereignty is theoretically tied to living in space. However, the tie is a very flawed one. If you look at the indexes you will see the three ties. First is the Strategic Index. This has absolutely nothing to do with living in space. It’s a measure of how long one group has had its grubby hands on a particular system. They could elect to never ever do anything in that system, and still get credit for “living in their space” in the form of defensive timer bonuses. Next we have rat kills, the Military Index. Killing rats is surely a sign that the space is lived in, but it’s perverse in terms of incentives. A good player can make more ISK per hour doing a number of different activities in other parts of the game. That is not to say that a lot of ISK does not flow out of 0.0, but it’s a sub-par activity for someone looking to optimize their time. AFK drone boats make up a lot of the activity. The Industrial Index, which considers mining alone, is even worse. Once you get over a desire to hold sov because of egotistic reasons you’re left with a pretty simple question, “Do I want to rat or mine in that system? If I do not, I have no need of sovereignty.” This leads me to an interesting thought experiment, ‘Does Pandemic Legion live in our own space?’ By the current system, the answer is ‘no.’ The metrics the game currently uses, where we make money by ratting and mining, would claim that we live all over the place; wormhole space, highsec incursions, lvl 5 mission hubs. As far as the game is concerned, those of us who do production, lead pvp fleets, haul goods, and provide services, we do not live anywhere. That is ludicrous. We live in A-ELE2 at the time I write this, in Delve. The moongoos of the local regions pour through our wallets. The locals cower before our capital fleet, or at least we like to think they do. We PVP here, when there is PVP to be had. We manage POS everywhere, fight over the assets that exist in space, and maintain a market for our war machine. We also probe the area for wormholes relentlessly, looking for doors to content. I would argue that we dominate the local area and exploit the local 0.0 resources at hand as well as anybody. And we hold no sovereignty at all. One fix of course would be to change the content ISK ratios to bring back our wayward pilots so that they will rat and mine from wherever we choose to stage. That would be a lot of extra ISK or trade goods flowing into the system. The alternative is that if you want us to care about sov, reward us for living in our space the way that we choose to live. I come up with a few possible metrics. Some of these metrics may be better than others. Some of these metrics may deserve more weight than others. The index for mining goes up to 5. Arbitrarily you may feel that a POS index should cap at 2 and a PVP index should cap at 1. However in each case I believe it is possible to have metrics that are not overly gameable, that legitimately reflect player activity on a wide variety of subjects. These are examples. These structures, the Citadels and other structures that are going to come, show a serious commitment to a particular area. Haulers have to bring in fuel. Fleets have to form to defend them. Why not credit sov holders for the labor of maintaining poses? Haulers with fuel can be ganked in route. The actual structures can be attacked and destroyed, which provides several vectors to reduce sov indexes. There is even a natural limit to the number of poses that can be put up. There are only so many moons in system. To limit POS spam I recommend that certain POS have more value than others. POS on high end moons could contribute many times more to the index than POS on empty moons. Or don’t credit an empty stick at all. A Citadel spending fuel on specific service rigs may have some decent level of value. Say whether the system has a market or not. Just don’t credit duplicate service modules. Looking for things is one of the ways people live in space. There are some professions that never blow a thing up, but do probe. I propose that probing something out is an indication that you live in the space. A site should only count for being probed once. This also encourages people to run the sites and get new ones spawned. Anybody can just suicide alts so killmails would not work as an indicator. That would just indicate a deep wallet. There are other ways of measuring PVP activity and dominance. I propose that an alliance that can keep the gates and stations bubbled (by bubbles that belong to them) is one that is dominant in PVP in the local area. We would have to set the criteria so that a bubble 300KM off the gate that is not in line with anything did not count. Maybe for a gate to count as bubbled the bubble would have to physically envelope the gate. This would force PVP to happen on occasion, when someone, a resident or a visitor, gets caught. Bubbles can be killed solo, so maintaining their presence indicates activity. Furthermore, an attacker looking to break the index could fly around blowing up bubbles. This puts something on the field that the defender could have a fight against. Many PVP groups that live in their space spend a lot of time gatecamping. The activity is entertaining to them. Furthermore big empires effectively garrison their borders to keep some of the sov trolls out. This is not a perfect PVP metric, but I feel that it illustrates that it is possible to gauge PVP activity to some degree. Throwing up your hands and saying that killing your alts invalidates any attempt to gauge PVP is weaksauce. Fatigue itself is an indicator of residency. We jump into our staging system and take fatigue all the time. We jump into systems we care about and take fatigue to fight there. Do you want to know where the power blocks are actually living in space? Look at where they get fatigue. And fatigue is difficult to game because it increases exponentially. A cyno ship worth a million ISK or so is always risked, or in the case of a jump bridge, the ship coming through is not in an entirely safe location. Still, you would want to reward fatigue multiplied (or somehow modified) by the mass of the ship taking fatigue. You don’t want to reward a noobship or T1 frigate jumping back and forth across a jump bridge network. Imagine a system. 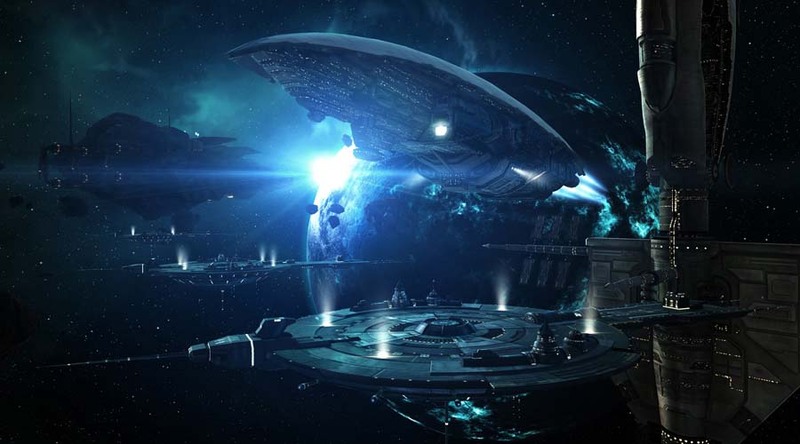 It is the staging point of a massive active capital fleet. Jump freighter pilots keep the market stocked. Intruders find themselves jumping into bubbles and quickly killed. There are several R64s, and R32s, which are owned and operated. Fleets form and bridge from here, sometimes travelling through wormholes to reach distant destinations. The second system up for consideration has an AFK ratting Thanatos and a guy who likes to multibox some Procurers. Which system is more occupied in your mind? Sovereignty can either be the thing you need for your IHub so that you can rat and mine in 0.0, or it can be a dynamic measure of power and who is living locally. I favor the second option. Sovereignty that people care about, that they feel fairly assesses their playstyle, is good for the game. As soon as you decide that sov has no real value, you lose some of the suspension of disbelief for the game’s narrative.